Chad's environment varies from wet savannas and grasslands to the arid outer reaches of the Sahara Desert. 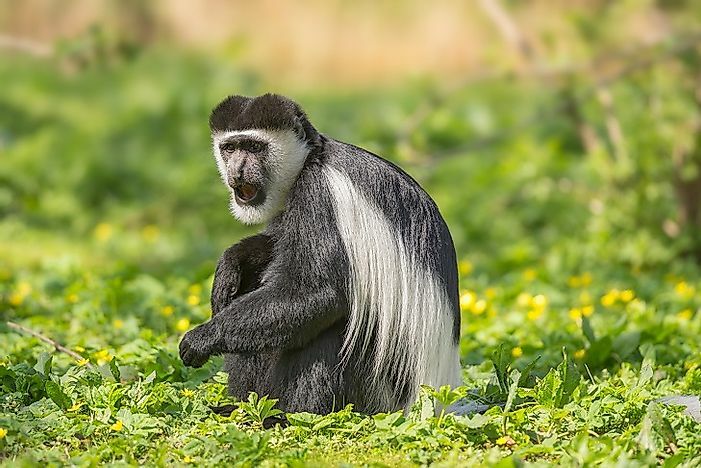 A black-and-white colobus monkey (Mantled guereza) in a savanna-woodlands transition zone in southwestern Chad. Chad's environment varies from wet savannas and grasslands to the arid outer reaches of the Sahara Desert. Chad is a landlocked republic located in Central Africa bordered by six countries. Its largest wetland area, Lake Chad, is the second largest lake in Africa which is home to mammals, reptiles, and birds. Three rivers flow into the lake which also keep marshes along the way a habitat for flora and fauna. Chad is blessed with an intertropical front that brings rain to the south from May to October and to the Sahel from June to September. Tropical and subtropical grasslands, savannas, and shrublands can be found in the East Sudanian Savanna ecoregion of Chad. This hot and dry region of Chad is situated in East and Central Africa. Flora consists of tall elephant grass and shrubs dominated by Terminalia trees. Plant endemism is quite common. Fauna is typical African with threatened species living precariously such as the giant eland, Masai lion, African leopard, Sudan cheetah, wild dogs, bush elephant. Conservation efforts are directed towards overgrazing and firewood collecting. The disappearance of the rhinos in the area has also raised concern. The Sahelian Acacia Savanna is the transition zone between the desert and the savanna that contains tropical and subtropical grasslands, savannas, and shrublands. It is situated in central Chad. Its climate is hot, windy, and dry with a short rainy season of one to two months with Chad receiving the most hours of sunlight a year among the countries. Flora consists of acacias, grasses, shrubs, and other trees. Fauna includes gazelles, lion, cheetahs, oryx, and dogs. Migratory birds also stop in the Sahel wetlands. Some animals have been extirpated due to poaching and hunting. Desertification and soil erosion threatens the area with famine and diseases becoming rampant among its population. The Lake Chad Flooded Savanna	nourishes people, flora, and fauna alike. Its flooded grasslands and savannas contain swamps, marshes, and bogs. Grasses dominate the area. The lake has around 89 fish species while the surrounding wetlands contain 179 fish species of which 25 are endemic. Birds, ducks, and waterfowls live among crocodiles, elephants, and hippopotamuses. Conservation efforts have been directed towards the decreasing water level of the lake which the countries of Nigeria, Niger, Cameroon, and Chad all share. Deserts and xeric shrublands dominate the East Saharan Montane Xeric Woodlands ecoregion in Chad. Tall mountains dominate the savanna in this eastern ecoregion located in the Ouaddai Highlands and Ennedi Plateau of the country. Occasional rainfall comes in the summer with mountain streams supplying most of the needs of the inhabitants. Plants here are common with the Sahel flora such as grasses and herbs. Antelopes, gazelles, rodents, and birds occupy their own niches in the region. Conservation is limited to agricultural areas with populations that have not been affected by the conflict between Darfur and Chad. The Sahara Desert is located in the northern reaches of Chad. Its deserts and xeric shrublands are inhabited by a small population of nomadic tribesmen with camels. Flat topography dominates the desert which receives a meager 7.9 inches of annual rain. Oases dot the sands where date palms prevail over garden and millet crops grown by sparse population of nomads. Herds of cattle compete with camels and native fauna for grass during the rainy season, Only ostriches, gazelles, and antelopes remain after the rains with the nomads leading their herds for better pasturelands. Several other types of ecoregions exist in Chad as well. These are the South Saharan Steppe and Woodlands dominated by deserts and xeric shrublands. Another ecoregion is the Tibesti-Jebel Uweinat Montane Xeric Woodlands	that contains deserts and xeric shrublands. The Dry Sahel has the Nilo-Sudan freshwater biome which is exactly what the Lake Chad Basin also contains. Climates vary from one ecoregion to another with small temperature variations. Animals congregate mostly in the wetlands, where large populations of fauna are seen.